The martian volcano Olympus Mons is about three times the height of Mount Everest, but it’s the small details that planetary scientists Patrick McGovern and Julia Morgan are looking at in thinking about whether the Red Planet ever had — or still supports — life. McGovern is a staff scientist at the Lunar and Planetary Institute and an adjunct assistant professor at Rice University; co-author Morgan is an associate professor of Earth science at Rice. 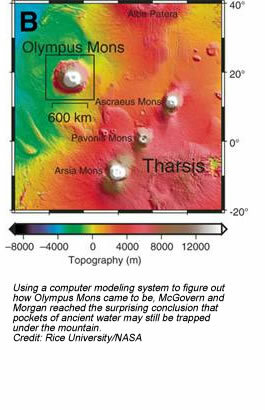 Using a computer modeling system to figure out how Olympus Mons came to be, McGovern and Morgan reached the surprising conclusion that pockets of ancient water may still be trapped under the mountain. Their research is published in February’s issue of the journal Geology. In modeling the formation of Olympus Mons with an algorithm known as particle dynamics simulation, McGovern and Morgan determined that only the presence of ancient clay sediments could account for the volcano’s asymmetric shape. The presence of sediment indicates water was or is involved. Olympus Mons is tall, standing almost 15 miles high, and slopes gently from the foothills to the caldera, a distance of more than 150 miles. That shallow slope is a clue to what lies beneath, said the researchers. They suspect if they were able to stand on the northwest side of Olympus Mons and start digging, they’d eventually find clay sediment deposited there billions of years ago, before the mountain was even a molehill. The European Space Agency’s Mars Express spacecraft has in recent years found abundant evidence of clay on Mars. This supports a previous theory that where Olympus Mons now stands, a layer of sediment once rested that may have been hundreds of meters thick. Morgan and McGovern show in their computer models that volcanic material was able to spread to Olympus-sized proportions because of the clay’s friction-reducing effect, a phenomenon also seen at volcanos in Hawaii. What may be trapped underneath is of great interest, said the researchers. Fluids embedded in an impermeable, pressurized layer of clay sediment would allow the kind of slipping motion that would account for Olympus Mons’ spread-out northeast flank — and they may still be there. Thanks to NASA’s Phoenix lander, which scratched through the surface to find ice underneath the red dust last year, scientists now know there’s water on Mars. So Morgan and McGovern feel it’s reasonable to suspect water may be trapped in pores in the sediment underneath the mountain. “This deep reservoir, warmed by geothermal gradients and magmatic heat and protected from adverse surface conditions, would be a favored environment for the development and maintenance of thermophilic organisms,” they wrote. This brings to mind the primal life forms found deep in Earth’s oceans, thriving near geothermal vents.